Is 'Ballers' a Realistic Look at Sports Agents & Managers? Is “Ballers” Realistic for Sports Agents? Ballers is a television show that is set in Miami. At the center of the plot is Strasmore, a character who attempts to convince Miami Dolphin players and former friends to sign contracts with his firm that will enable him to manage their money, despite the fact that Strasmore himself is broke. Strasmore has honorable intentions and tries his best to persuade players to follow his wise advice. 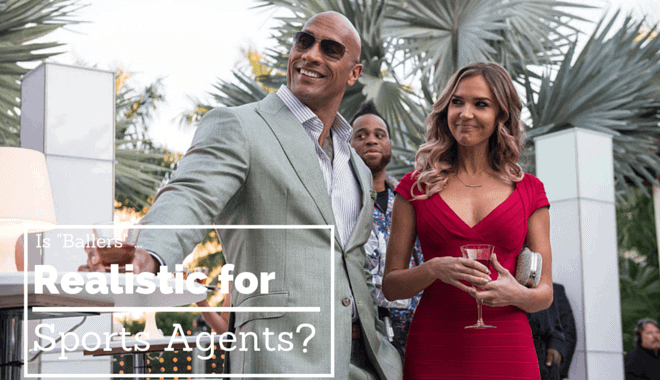 There is an abundance of conventional plotlines throughout Ballers – like an overabundance of beautiful, naked women, players who spend money irresponsibly, frequent drug use, and plenty of drama between teammates. While the show is certainly entertaining, how accurate is the show’s depiction of a sports manager’s life? Here are a few things that the show has gotten right…and wrong. Sports agents and managers who are just starting out do not have the relationships required in place to begin immediately attracting all of the best clients. These relationships take time to cultivate and develop, and it is not uncommon for the process to take years – even for former athletes turned manager/agent. Sports managers and players maintain professional working relationships, but rarely does the relationship cross the line from “professional” to “personal”. A professional sports manager or agent will command the respect of the players they represent, but they do not hang out with another and party together. A sports manager cannot be called a friend in the sense that a player would refer to a childhood friend. Sports managers and their clients do not party together. This is one area where the show’s writers took plenty of creative licenses. Sports managers do not party or do drugs with their clients; however, they often do things such as play golf together or sit with a player’s parents during a game. Such moves are calculated to cultivate and deepen the relationship between the manager and their client, but that is often as far as it goes. In one moment on the show, a player asks Strasmore for a loan, and this does happen fairly frequently. It is up to each individual sports manager to decide whether or not this is a practice they are comfortable doing, but many managers and agents give out loans in the hopes of securing the player as a client. Sports managers and agents do provide their clients with plenty of guidance regarding financial management and their overall journey through life. Sports managers oversee many aspects of their clients’ lives, and in turn, players tend to lean on their managers heavily for guidance, and this is especially true even after their careers are over. For athletes, the show should serve as a cautionary tale. Aspiring sports managers should watch the show to identify the issues in each episode and develop a plan for dealing with them on the off chance that they should arise.